They bloom in late spring along streams and in moist woodlands. There is one stem with many leaflets, that look similar to Jack-in-the-pulpit. 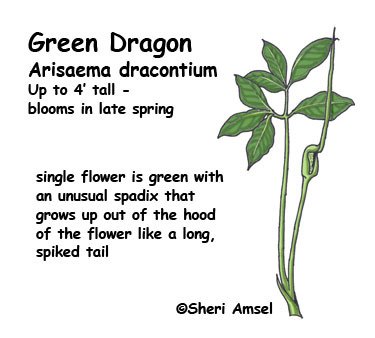 The single flower is green with an unusual spadix that grows up out of the hood of the flower like a long, spiked tail. Leaf Type: Cup-shaped around the spadix which grows out and up in a long, thin spike, another leaf with 5-15 egg-shaped entire (smooth edge) leaflets grows taller than flower.